categories: dog powered versions of human sports (like ski-joring, roller-joring, carting, etc. ), competitive versions of a working activity (sheep dog trials, tracking tests), and entertaining activities to do with your dog (musical freestyle, flyball, etc.). by Bella Levorsen, Sierra Nevada Dog Drivers Inc. 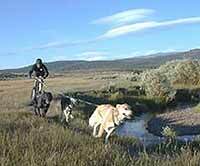 Learn the basics of skijoring, canicross, bikejoring and rollerjoring. Gain insight into required equipment, proper fit and training techniques. trials, Rally-O (rally obedience), trail dogs, frisbee, musical freestyle.